They teach this new thing—that in Jesus there is resurrection from the dead—without qualification or apology - Acts 4:2. 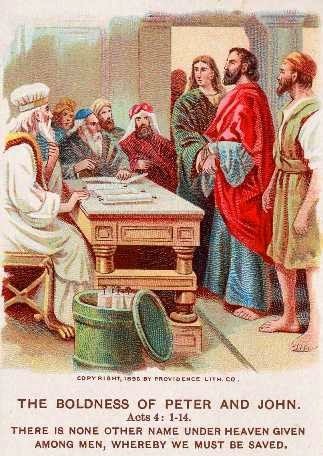 When arrested Peter answers boldly, "filled with the Holy Spirit" - Acts 4:8. The rulers put the pieces together: the disciples' uncharacteristic boldness + their uneducated state = amazing. But then an "aha" moment. Doesn't this remind them of someone? "They realized they had been with Jesus"—whose teaching was also characterized by boldness (Matthew 7:29). Even the rulers' threats and ultimatums have no effect - Acts 4:19,20. It comes as a result of following convictions and leaving the fallout in God's hands, as Shadrach, Meshech and Abednego discover - Daniel 3:16. It comes to Joseph of Arimathea when the situation is desperate and unless someone steps up, this friend and teacher will have no respectful burial at all - Mark 15:43. The Day of Pentecost and the coming of the Holy Spirit on all believers is a watershed moment in the story of holy boldness - Acts 2:1-42. The disciples get a new dose as a result of prayer - Acts 4:31. It makes new believer Paul careless about his very life and well-being - Acts 9:29. Later, in Ephesus, it causes him to minister boldly, persuasively and persistently. When opposition to his meetings arises, he doesn't quit but moves them from the synagogue to a lecture hall and continues to preach his controversial message for two more years - Acts 19:8-10. When he is in Rome, he keeps witnessing about and explaining the gospel despite his chains (Acts 28:20,31). Paul says that one of the wellsprings of his boldness is the realization that the message of the gospel isn't his project and spreading it isn't from his own initiative but it is a message that God Himself has entrusted to him - 2 Thessalonians 2:2-4. Are you happy with your boldness quotient? I know I'm not happy with mine. These Bible examples of holy boldness give us much to consider and pray about as we go before God to seek His insights on why there is so much timidity in our lives. PRAYER: Dear God, I know I need more holy boldness. Please help me understand the roots of my timidity and deal with them. Amen.